After the crash of 2008, the US economy has been on an upswing ever since. Granted, the recovery has been slow, but it has been stable. We have now gone almost one decade without a slowdown, which has a slew of experts predicting that another recession is around the corner. To support their prediction, they point to rising household debt, political instability, and flat corporate earnings. 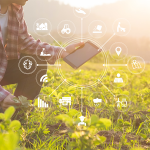 There may be some grain of truth to what the experts are saying, but that doesn’t mean that we can’t do something about it. Enter Millennials. Millennials get a bad rap for being entitled, shallow, and narcissistic, but they are actually doing more than any other age group to keep the economy growing. Housing is a key pillar of the economy. According to Fannie Mae, housing accounts for roughly a fifth of the US Gross Domestic Product. In addition, when people buy a house, they also spend on furniture, appliances, remodelers, movers, and more. The National Association of Home Builders reveals that a buyer of a single-family home usually spends $7,400 more on average against a homeowner who does not relocate. Home buying triggers a ripple effect that stimulates greater economic activity. Accordingly, a strong housing market points to a sound overall economy. 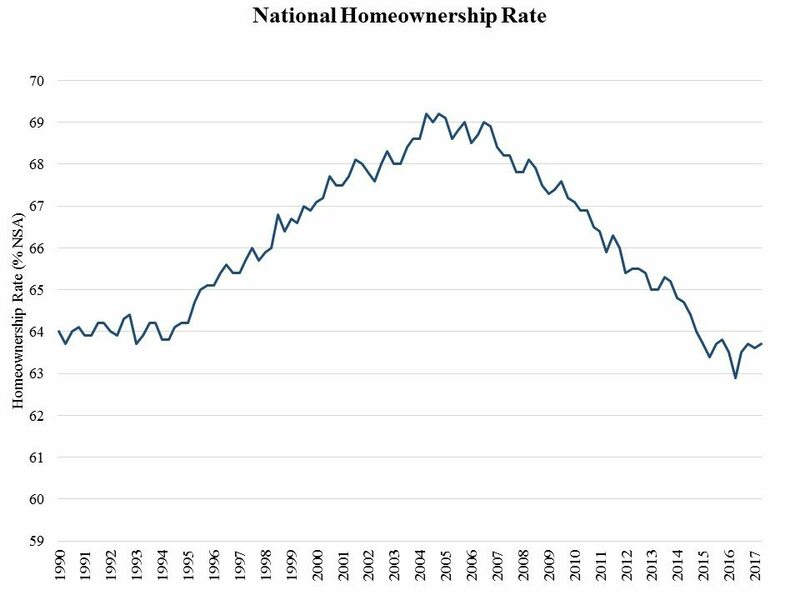 The homeownership rate among Americans has been plummeting for a decade. Recently, however, it has been stabilizing, giving experts a reason to believe that the worst is behind us. It appears that Millennials are finally becoming a major player in the housing market. Delayed by hefty student loans, older Millennials who are in their late twenties and early thirties are finally playing catch-up in homeownership. 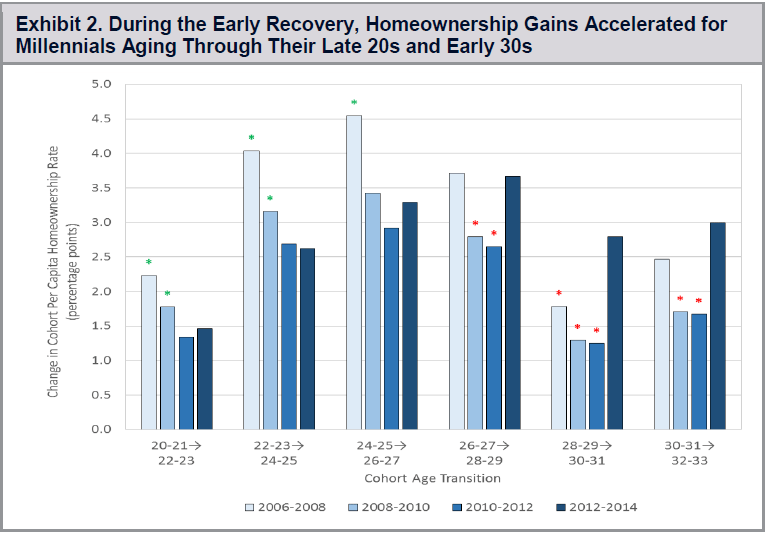 Advances in the homeownership rate of Millennials in their late twenties and early thirties between 2012 – 2014 were significantly larger than the gains of earlier cohorts in the same age range during the housing crisis of 2006 – 2008 and during the early recovery period from 2010 – 2012. This trend led experts to believe that older Millennials are finally entering the housing market, indicating early signs of recovery in homeownership demand. This year, it seems that Millennials are starting to flex their muscles. According to mortgage data analysis company Ellie Mae, Millennials are now the largest group of homebuyers. January 2017 saw Millennials representing roughly 45 percent of all purchase loans, up three percent from the same month of the previous year. Although saddled by cumbersome student loans, Millennials are picking up the pace in homeownership, and that could give the housing market a much needed boost. Millennials are also boosting other sectors related to the economy, such as furniture and bedding sales. 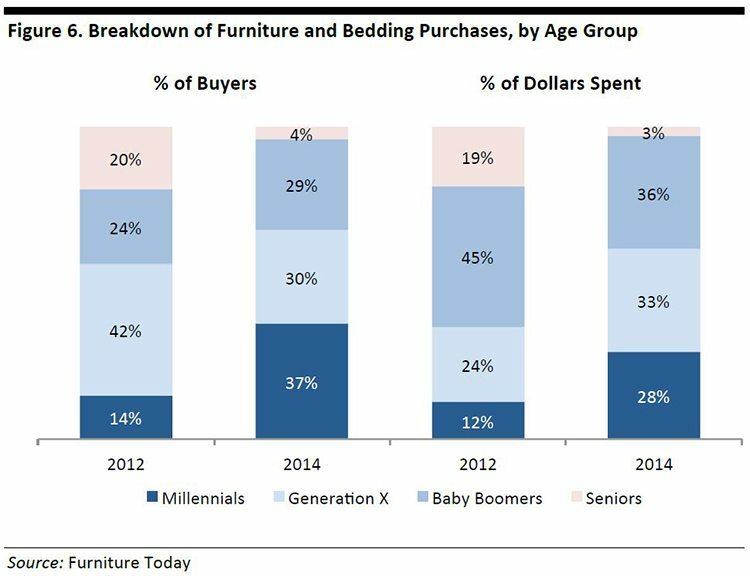 A Consumer Buying Trends Survey by Furniture Today shows that Millennials have dominated the US furniture and bedding market in terms of sales. In 2014, they comprised 37 percent of the market, more than doubling their 14 percent share in 2012. During the same period, their share of spending on furniture and bedding soared from 12 percent to 28 percent. The auto industry historically contributes up to 3.5 percent to the US GDP. During the 2008 recession, the auto industry was deep under water until Congress passed auto bailout legislation. Almost a decade later, the industry has managed to post increases in sales for a record seven straight years. The Millennial generation is a significant contributor to that unprecedented run. 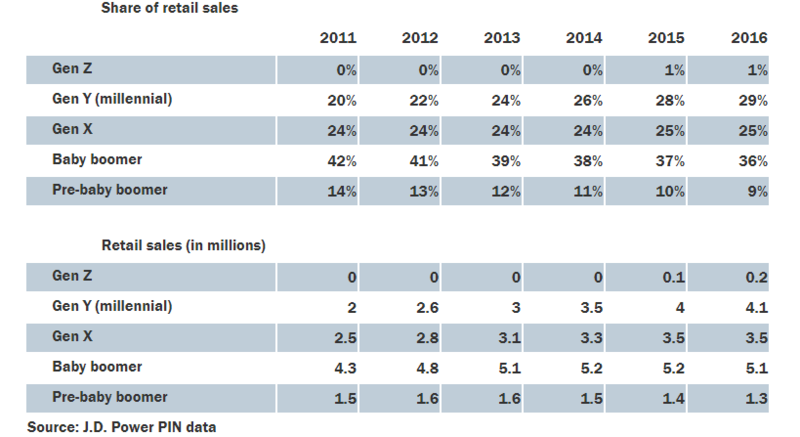 The graph above illustrates car sales performance across generations from 2011 to 2016 in terms of market share and units bought. Starting in 2011, we see Millennials steadily increasing their representation in the car sales market. In 2016, they surpassed Gen X to capture the second largest market share, and come within the rear view of boomers after purchasing a total of 4.1 million vehicles. Automotive News reports that in California, the largest car market, Millennials have surpassed boomers for the first time. Having a baby means a big rise in expenses on an individual level, so an increase in birthrate has an impact on the overall economy. According to Wharton research, infants 0 – 2 years old cost $12,940 per year. Retail stores are feeling more upbeat with an uptick in sales of baby clothes and toys. More kids also mean more beds, pillows, diapers etc. In addition, people with children are more likely to purchase a home. Of course, millennial parents will continue supporting their kids until they reach adulthood or graduate from college. The same Wharton research shows that kids 6 – 8 years old cost $12,800 which is slightly less expensive than the expenses associated with infants. However, the figure goes up to $14,970 for teens 15 – 17 years old. Expenses skyrockets when these teens attend college. The estimated annual cost of higher education in 2035, when Millennial babies will be in college, is $110,674! Every purchase to support an infant adds up and eventually contributes to the whole economy. The country’s birthrate has been steadily declining since 1960s. An extremely low birth rate poses dangers such as insufficient taxes to keep the economy stable and the inability to replace an aging workforce. After some delay, however, the good news is that millennial women are finally having babies. 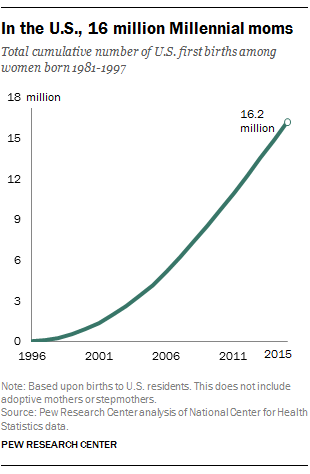 According to the Pew Research Center, 1.3 million millennial women gave birth for the first time in 2015. Now that Millennial women are becoming moms for the first time, the economy is bound to benefit from the notable increase in consumption. An aging population is bad news for any country. In one study cited in a FRED publication, the authors show that a growing percentage of older workers and a decline in fertility eventually diminishes the labor pool of younger workers. Deflation ensues. Japan is a classic example of this crisis. Various Japanese industries are struggling because of a severe shortage of workers and aging owners with no successors. The cycle of low fertility and low consumption has resulted to trillions in lost GDP. Experts believe that if the cycle is not stopped on its tracks, Japan may enter a phase of long recessions that can cripple the country’s economy. Baby boomers are abandoning the workforce in a massive retirement exodus of about 10,000 a day. As they march towards their sunset years, boomers leave a workforce gap that Gen X’ers cannot fill because they simply do not have the numbers. According to a Federal Reserve study, a shrinking labor force has an impact on the local economy, tax base, and workforce. College-educated Millennials are poised to pick up the slack. 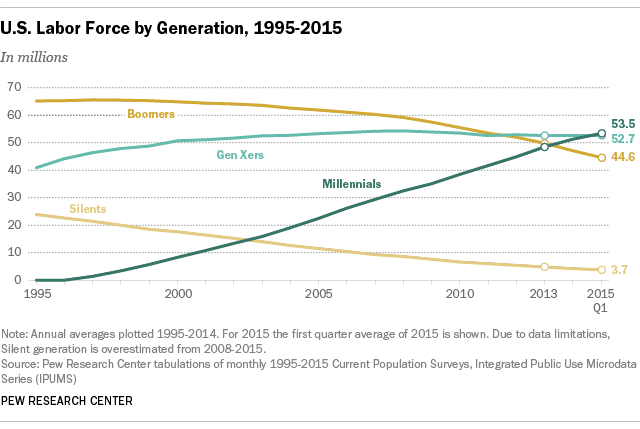 Generation Y has now overtaken Generation X to become the largest share of the American labor force. Pew reports that Millennials ages 18 – 34 now occupy over one-third of the country’s workforce. They often work as food servers, managers, interns, sales associates, and cashiers. While many are starting from the bottom, Millennials are helping to keep the country’s aging labor force stable. Even Millennials who aren’t buying homes or cars or having children are still boosting the economy with their collective spending power. As Millennials dominate the country’s workforce, they are reaching their full income potential. According to Oracle, their projected income is expected to reach about $3.39 trillion by 2018. 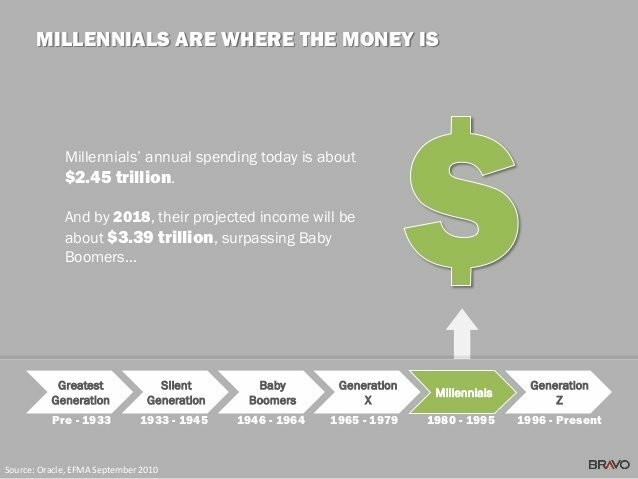 By that time, the income of Millennials will overshadow that of Boomers and will hover close to the income of Generation X. In previous economic booms, people spent way above their means. For instance, the upsurge before the 2007 recession saw household debt outpacing disposable personal income. A FRED study shows that in 2008, there was a wide margin between the two variables as household indebtedness peaked at $13.9 trillion while disposable personal income stood at $10.7 trillion. The rising mortgage and consumer debt eventually contributed to the 2008 economic collapse. 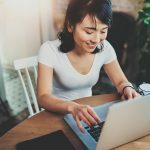 History may not repeat itself this time around as Millennials cultivate a healthy financial approach that involves limiting debt, paying off debt in a timely manner, and saving for the future. Other than student loans, Millennials have been careful with other types of loans. Data reveal that they use credit cards as a strategic tool to build credit ratings. Whenever they incur debt, they tend to pay it off aggressively. 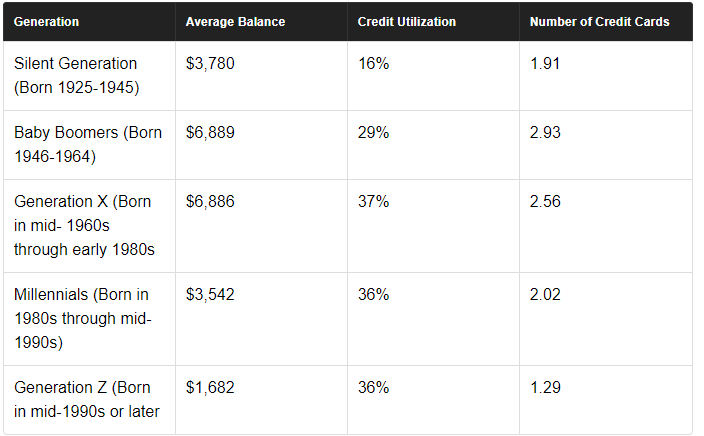 Millennials have lower credit card debt compared to earlier generations. That’s because roughly 6 out of 10 Millennials prefer to pay in cash than in credit. They understand that to settle debt, they must also avoid incurring more debt. On the other hand, those who use credit cards often do so as a strategy to build their credit score. The reputation that Millennials handle money poorly isn’t born out by the data. Pew research reveals that the average credit card debt among individuals aged 25 – 34 years old actually declined from $2,500 in 2001 to $1,700 in 2010. In addition, a recent NerdWallet study showed that Millennials are on pace to out-save Boomers and Generation X’ers when it comes to retirement savings. Take note that Boomers have had decades to prepare for retirement. Millennials also love to buy local products. An Edelman Digital study reveals that 4 out 10 Millennials prefer to shop local even if it’s a bit pricier. More important, they prefer to purchase products made in America. Around 7 in 10 Millennials claim that buying American products is important to them. They want to support the local and the national economy. Millennials have been sitting on the bench for quite some time because of the recession and massive student loans to the point of being referred to as the worst generation ever. However, their bad reputation is unwarranted. Millennials’ income and position in the labor force are growing. As a result, they are beginning to make big-ticket purchases that could potentially save the national economy. Do you have any thoughts on how Millennials will save the economy? Feel free to share your comments.